It is a sad day today, as we’ve just said goodbye to our motorhome 🙁 . Precisely 1 year after we picked it up – to the day. So many good times, and think of all the places it took us! The vehicle may go, but fortunately the memories stay with us (see further down for a series of photos). Sale price ended up being exactly what we paid for it, which is what I was wanting, so happy with that! Though it has an extra year and 32,000 km’s on it, we did spend money improving it – solar system, inverter, bike rack etc. It’s the question we are asked most frequently: Where are the best places to visit? Or one of many similar variations such as ‘Which place did you enjoy the most?’. Well, I’ve both good and bad news for you. The good news is that you can go almost anywhere in Australia, and you’ll see stunningly beautiful landscapes. The bad news is that ‘best’ or ‘nicest’ are very subjective as everything is so different – just as apples are different from toothbrushes (sorry, oranges are too similar to apples to use them in that metaphor 😉 ). How can you compare the imposing structure of Uluru, to incredibly diverse wildlife at Kakadu, to jumping into rock pools at Litchfield, to gem stone mining in QLD, to stunning beaches in southern WA, to majestic views from the Flinders Range, to climbing through gorgeous rock canyons in the Pilbara, to…. I think you get the idea! There were many standout locations for us personally. Any list must be viewed in that context – what we enjoy may be different to others preferences, as we have our own lenses, our own likes and dislikes, through which we view everything. Everybody copes with travel differently – some are happy to spend years out on the road travelling a nomadic type lifestyle. We came across a number of people like this; Jan, who we met at Genoa is an example. She’s a single middle-to-older aged lady and has been on the road for 14 years now, and had a motorhome identical to ours! Then there are others who can’t stand being away from home/work for more than a week or two, and just have to get back regardless of what further travels were planned! Writing this blog probably helped me a little, both in terms of a task/goal and in terms of contact/relationships with people. Of course there was also direct contact with family and friends via phone, texts etc. Nicole enjoyed the travelling lifestyle (except for the dirt roads 😉 ). It really suited her! She may have become a little anxious in the final month or two, but I think that was actually due to the thought of having to come back, more than the long time spent on the road! Looks like we’ve got ourselves another home – one that isn’t on wheels!!! 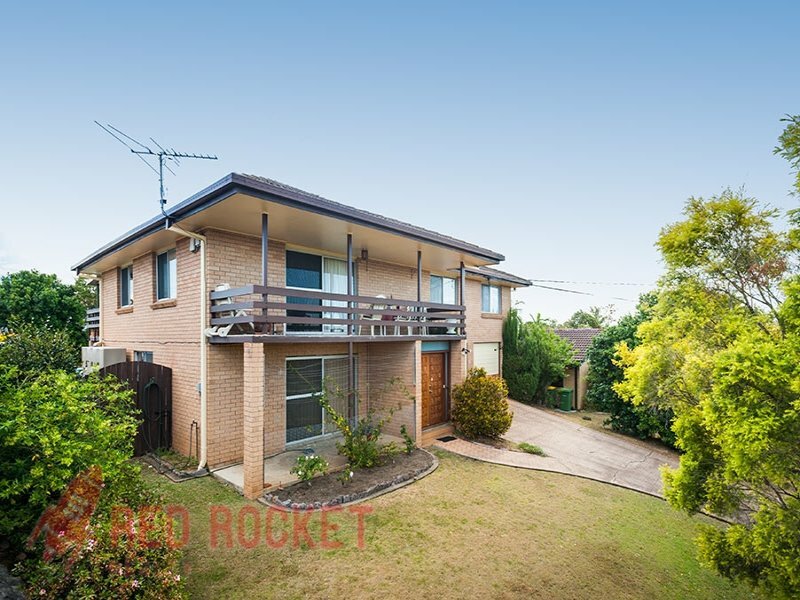 Contract signed, got to organise finance now… Nice big brick house, only a street away from our previous rental in Rochedale South. Bought from the original owners, so could do with some cosmetic updates (but is completely livable as is). 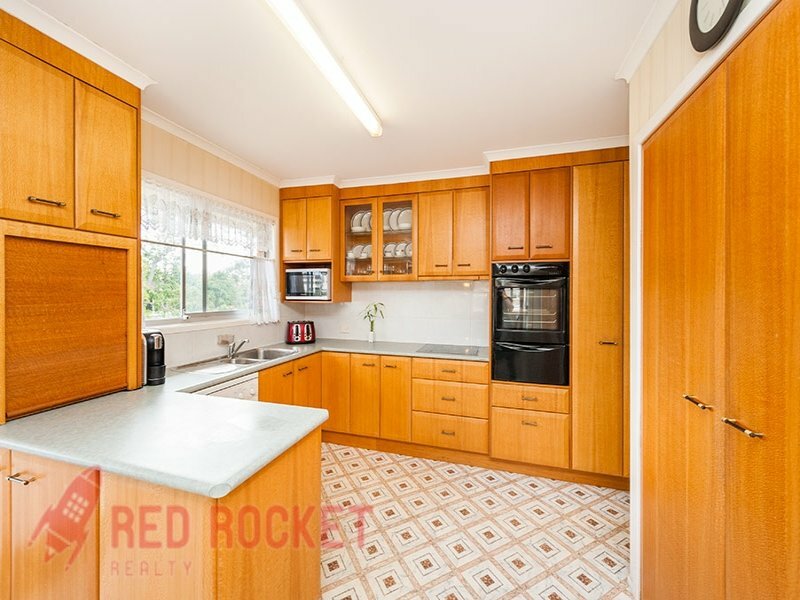 That is silky oak throughout the kitchen, one of the most beautiful timbers around! Plenty of space for teenage boys, and a pool out the back makes them happy…. The most trusting bloke in Australia is on the Fleiurui Peninsula in South Australia. He’s a mechanic and has a small service station out the front. It’s all old mechanical equipment, and a note on the bowser says to remember the dollar value to advise the bloke when you pay. Sure enough, you walk into the office, he leaves the car he’s working on and joins you at a desk, you tell him how much fuel you put in (in $’s), pay him that much, he writes the number down in a table on some paper, you walk out and drive off, he goes back to work on the car! The most trusting woman in Australia is from the rural Yorke Peninsula town of Maitland, South Australia. We were in the post office organising my license docs when a woman came in to collect a parcel. Stood talking to the attendant for a while. We left and went out the front door, noting the baby in a stroller she had left waiting outside the post office…. Cheapest pedicure in Australia is at a palour in Rockingham, a town a little to the south of Freemantle, WA. How does $25 sound? Typical pedicure (from what I’m told – never had one myself!) starting with your feet in a hot rock spar bath, and a full body massage in a massage chair. Run-in’s with the law? Just the one! On our return to Brisbane I found a nice little letter from the Victorian Police… Turns out a camera had caught me speeding in the motorhome! Speeding in a motorhome, of all things! Coming into the town of Marlo in Victoria’s East Gippsland, I hadn’t slowed to the town speed limit soon enough… Oh well, it’s my first ever traffic infringement of any sort – not too bad to get to 37 with a perfect record! Marlo, the home to an ugly sea lion and the loss of $185 and 1 demerit point! This was consistent with our general plan to spend most of our time in the states furthest from home, which we can not easily visit during normal annual holidays. We explored very little of QLD and NSW, due to living close by and having already seen many of their attractions. So for any overseas readers, these two states have a huge number of beautiful places and attractions that are not even mentioned in this blog. 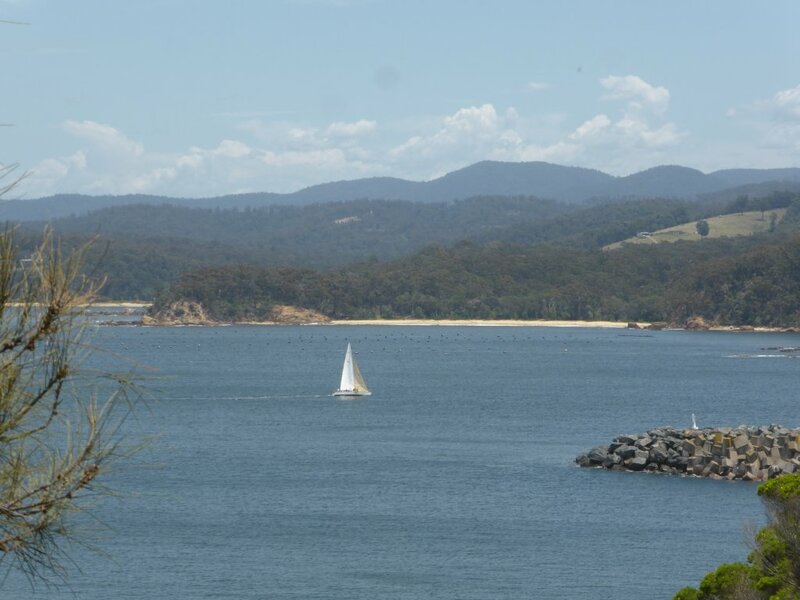 We did not visit Tasmania due to time constraints, and ferry availability and costs. 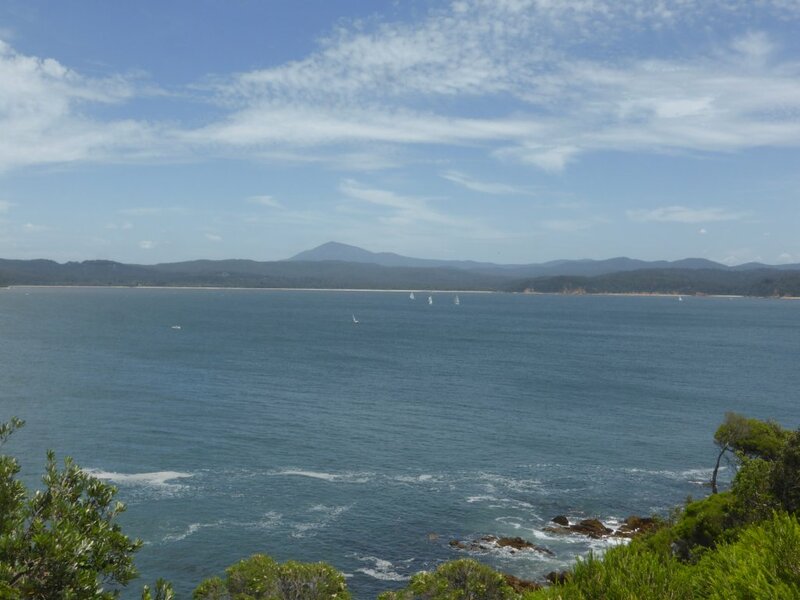 Tasmania is on the list of places to visit sometime. 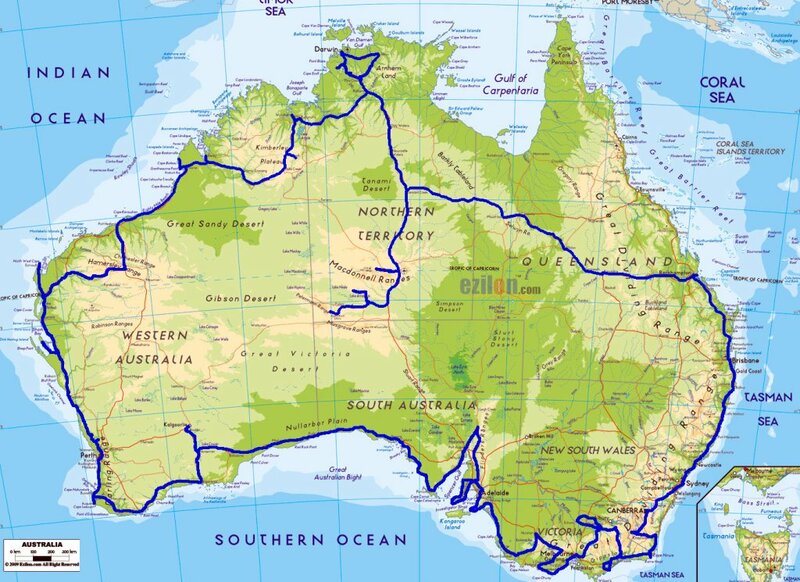 I’ve sketched our route in the map below (very approximate!). Distance travelled: 29,842km’s My original estimate of 30,000k’s was spot on! We’ve made it – our amazing trip is over! After 6 months having an absolutely awesome time travelling around Australia we are back home. Wow, back to ‘normal’ life! 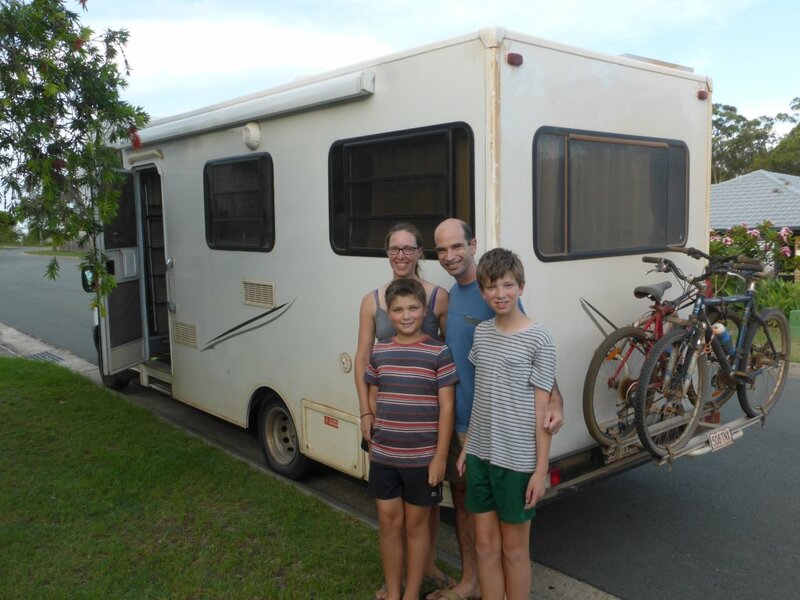 Well kinda of, we don’t actually have our own home to go back to yet… but we’re back in Brissy! Happy to be on holidays, and now happy to be home! the motorhome looks a little more ‘used’ now! Having conquered Mt Kosciuszko, and with less than a week remaining in our AroundAus trip, we left Thredbo resort in the NSW ski fields and headed off to our capital city – the land of politicians and bureaucracy. Speaking of politicians, on the other side of Canberra the Federal Hwy (heading north) descends steeply revealing a huge flat plain straight ahead. The hwy ends up skirting around the edge, but clearly visible in the mountains on the other side is another large wind turbine farm. Looks good to me, but this must be the one that federal treasurer Joe Hockey calls an eyesore… What a turkey! But this visit to Canberra wasn’t all about politicians and turkeys. 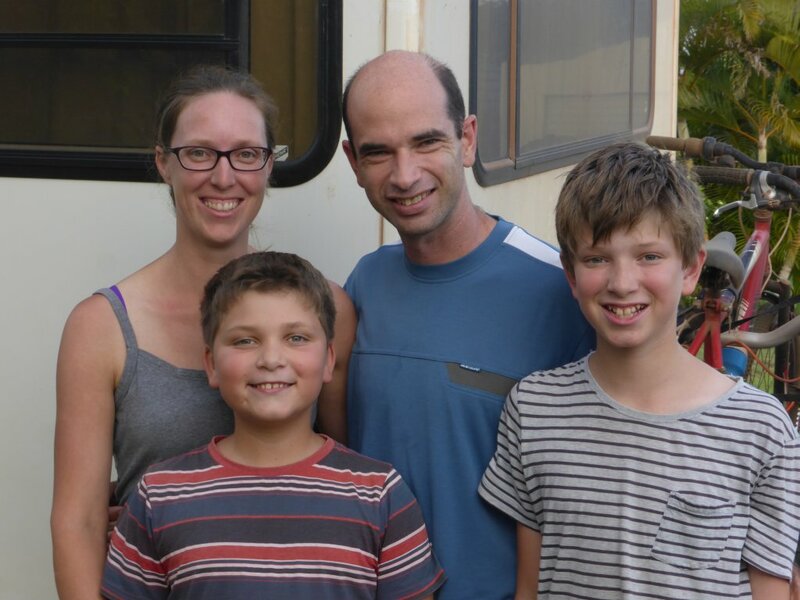 One of the main reasons for visiting was to see my uncle and aunty; Richard & Lyndal, and their two kids Yasemin and Jonny. As unlikely as it seems, it turned out that Lyndal was visiting Brisbane for the few days we were in town, but we did get to catch up for a couple hours before she boarded the plane. We spent more time with Richard and Yasemin, and the boys had a great time with Jonny. Mostly based around their mutual interests in soccer – out in the yard and on the x-box. Now Daniel is researching x-boxes so he can play FIFA 15 more…. 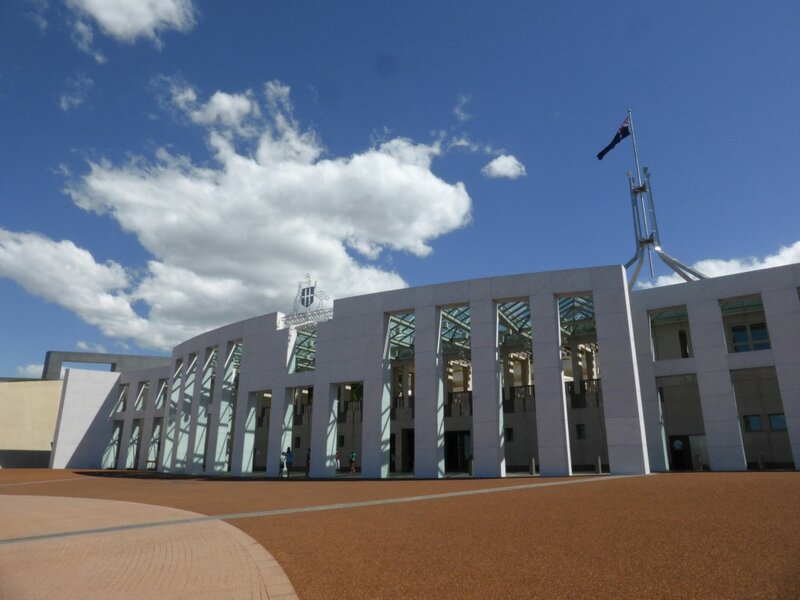 In our few days in Canberra we also fitted in a number of sight seeing activities – Questacon, Royal Australian Mint, National Arboretum Canberra, Parliament House and the War Memorial. Believe it or not, I think I actually found Parliament House the most interesting of all those! We arrived just in time for the 2pm tour, after spending the earlier part of the day at Questacon. The tour guide went through and explained the design and construction of the building, which seems well designed and nicely finished. We viewed the Great Hall, the House of Representatives chamber, the Senate chamber and more. He explained some of what happens and why. It would be good to see a lot of our Parliamentary processes changed – a lot of the ridiculous procedural technicalities and stuff based on old laws and traditions for starters. Whilst we are dreaming about improvements, we could also make the whole thing a bit less oppositional and put a more constructive tilt to our parliamentary discussions/arrangements/operations, and somehow require more of a long term focus in all decision making. But all in all, despite its many shortcomings, we’ve still got one of the best systems in the world. We made it – to the top of Australia! 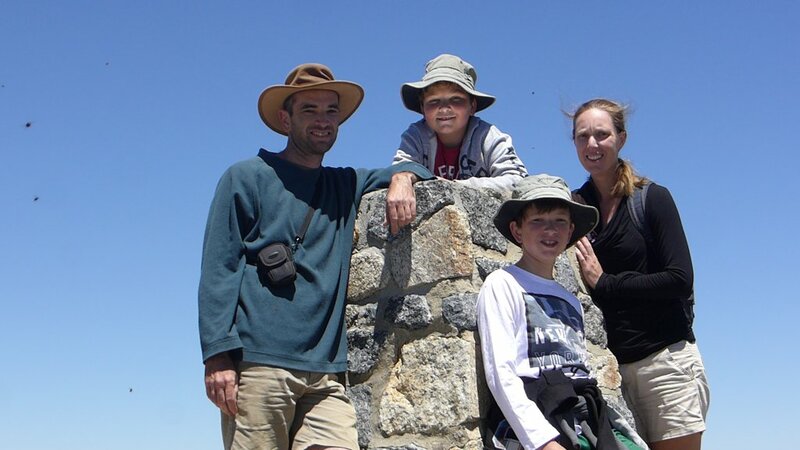 Here we are on Mt Kosciuszko’s peak, physically higher (more elevated?) than anybody else on Australian soil. It was a tough, steep and dangerous climb up the side of this incredible mountain. 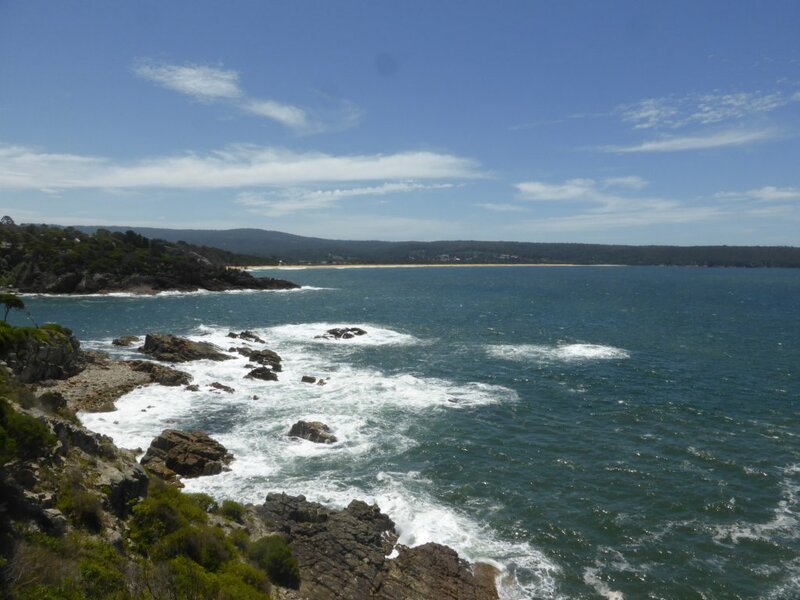 OK OK, I’m exaggerating a little – it was actually an easy stroll up a wide boardwalk and a well formed path…. that doesn’t sound as impressive though! Anyway, I’m getting ahead of myself, as we had to get there first.